How do I limit when an employee can punch in/out? Punch Limiting allows you to limit when your employees can punch in or out. Our Punch Limiting feature gives you more control over when your employees can punch in or out. While it will limit when they can punch time, your employees will still be able to login to their accounts if they need to do things such as review their time cards, submit a time card for approval or request PTO. You can create as many Punch Limiting Rules as needed, but an employee can only be assigned to one rule at a time. To create a Punch Limiting rule, you'll want to select Settings --> Punch Limiting. Once on the Punch Limiting page select +Add a New Punch Limiting Rule. Give your Punch Limiting Rule a name and then decide how you'd like to limit your employee's punches. The first option available allows you to specify how many minutes before or after a shift an employee can punch in/out. This option can only be used with scheduling and will remove the ability for your employees to select "No Shift" when punching time. 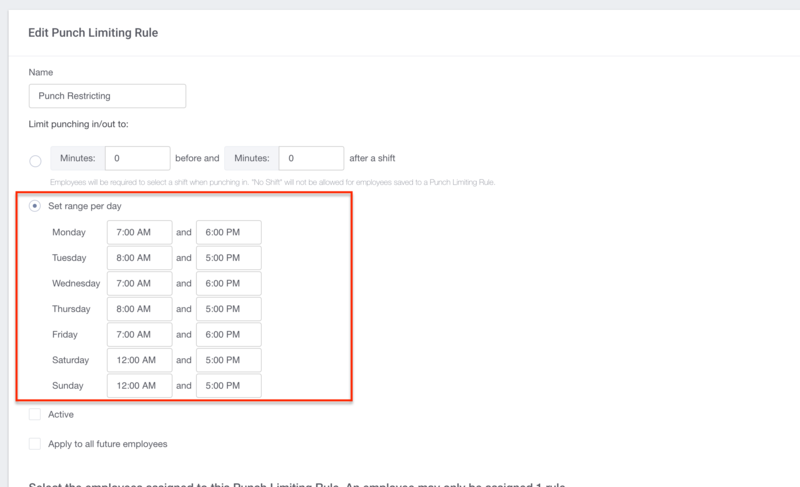 The second option available allows you to set a specific timeframe when your employees are allowed to punch in/out. This can be setup on a per day basis if your employees have different shift times. This option does not require scheduling. Once you have chosen the option you'd like to use, just check the Active button and apply it to whichever employees necessary.